, 33 by 48.5 cm. This early oil painting, dating from the mid to late 1930s, already demonstrates Vaughan’s interest in combining architectural elements with natural forms. He was still exploring the same pictorial ingredients forty years later, in his late Essex landscapes. Chimneystacks, regular fenestration, rooftops, gable-ends, barns and outhouses supply the formal, organized elements that he was habitually attracted to. Their orderliness and warm tonalities are played off against the more organic shapes and a range of greens supplied by the surrounding fields and trees. 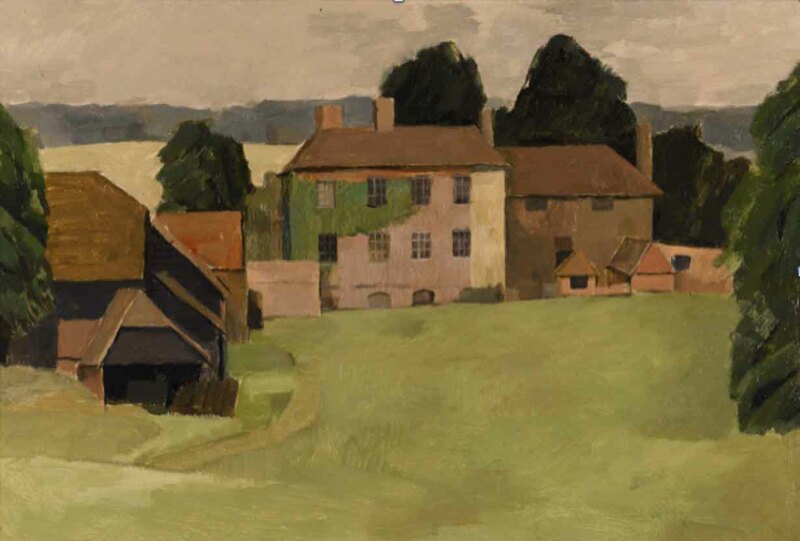 Vaughan’s preference was for landscape that retained evidence of man’s involvement and therefore, local houses, gardens, cattle shed, wooden huts, copses and orchards tend to feature in his paintings. He added further pictorial accents to his compositions later by incorporating abandoned agricultural objects, distant church towers and fence posts. Other recognizable features that appealed to his sensibility include hedgeless pasturelands with views across open fields towards distant foliage, patchwork meadowlands and squared-off farm buildings. Even when there are no figures included, we are always reminded of man’s presence in nature in Vaughan’s landscapes. His preferred scene was, at once, natural and man-made – a landscape that retained evidence of human intervention. He was drawn to farmland rather than rolling hills and arable landscapes shaped by man, rather than awe-inspiring mountain scenes. This preoccupation with things intimately idyllic and privately pastoral can, of course, be traced back to William Blake and Samuel Palmer. The presence of man in their work, too, is often implied rather than directly represented and, moreover, the evidence of man’s good management and husbandry communicates something health-giving and moral to the viewer. Watercolour and gouache, 28 by 21.5cm. London, Whitechapel Gallery, Keith Vaughan, March – April 1962, cat. no.181. , 43.5 by 40cm. 1962. London, Hampstead Art Centre, Survey 66, 1966, cat. no. 96. Anthony Hepwroth and Ian Massey, Keith Vaughan: The Mature Oils 1946-1977, Sansom and Company, Bristol, 2012, cat. no. AH386, illustrated p.181 (as Untitled: Orange and Red).